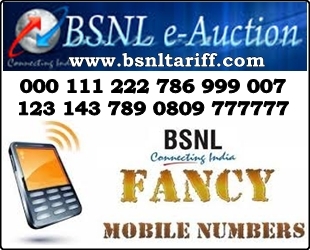 Leading-Telecom Operator in India Bharat Sanchar Nigam Limited (BSNL) announced e-auction for BSNL Vanity/Fancy numbers across their Bihar Telecom Circle. The Competent Authority of Bihar BSNL uploaded BSNL Vanity Numbers online for its valuable customers in Bihar Circle at fixed price. Offer announced for limited period for 10 days under promotional basis. Registering their mobile number and paying registration charges Nominal (Non-refundable) on selected vanity number for bidding. Sending SMS for bidding shall be charged @ Rs.5/- per SMS and Nominal Registration charges (Non-refundable) for vanity number participation. The bidding shall be allowed in multiple of Registration charges (Non-refundable) above the minimum reserved price of fixed (Excluding Service Tax). The BSNL Competent Authority of Bihar Telecom Circle started bidding of vanity/Fancy numbers with base price available under various levels in Bihar Circle. Customers can register their personal vanity/fancy numbers through Online or sending SMS (from their mobile phone). Registration charges will be applied for registration for each number and procedure guides about how to bid personal vanity/fancy number to participate in Bidding. The above registration process will start from 05-09-2013 00:00:00 hrs and ends on 14-09-2013 23:59:59hrs.